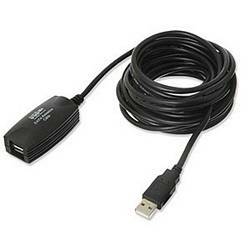 Use this USB 2.0 active extension cable to eliminate the 16-foot length barrier of most USB cables. You can arrange your USB peripherals where they are most convenient instead of where the cable allows you to. This bus-powered cord extends the range of your USB peripherals while maintaining signal integrity. Up to five extension cables can be daisy-chained to span a distance up to 80 feet. Requires Microsoft Windows 98SE/Me/2000/XP/Vista or Mac OS X+.